Diatoms. Single-celled, photosynthesizing algae with silica cell walls found anywhere there is water and light. Most are invisible to the naked eye in a glass of water. In fact, they are so small that about 1000 of them could fit into this “o”. If I asked you to envision these creatures under a microscope you might picture a small creepy looking bug-like creature possibly with some leaves sticking out – at least I did when diatoms were first described to me. Well, I am happy to inform you that we were both incorrect. Above is a picture of many different species of diatoms under a microscope. Definitely not bug-like creatures with leaves sticking out. 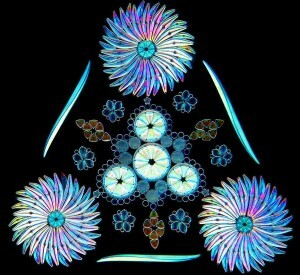 Diatoms are some of the most beautiful, yet underappreciated organisms on the planet. Not only are they responsible for producing about twenty five percent of the world’s oxygen, they also make up the basis of the oceanic food chain. Diatoms get most of their energy from sunlight during photosynthesis, but they also require a few other key nutrients. Diatoms need silica to build their cell walls, and phosphate and nitrogen. Diatoms are food for some of the smallest plankton such as rotifera, and copepods. These are eaten by pteropods and other macroplankton. Moving up the food chain, diatoms are responsible for providing nutrients for bigger animals whose names are more recognizable such as fish. Without this strong base of nutrients from diatoms, the whole food chain could crash. It amazes me that nature can produce creatures so tiny, yet symmetrical, intricate, and elab orate. 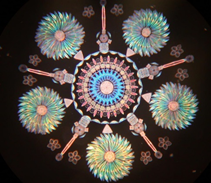 Meet Klaus Kemp, an artist and scientist who has dedicated his life to diatoms. Kemp spends his days examining diatoms under a microscope. 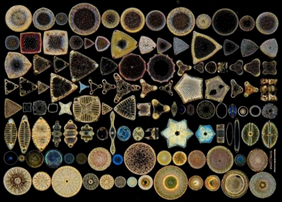 He also created a database of diatoms with over 15,000 species images! Using a Victorian style microscope technique, he carefully places diatoms under a microscope to create stunning works of art. 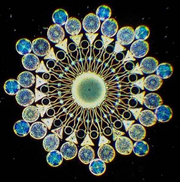 It is important to note that diatoms are not found like this in nature; when one looks at a glass of seawater under a microscope this is not what is seen. Kemp has (I’m assuming) spent months or even years finding and carefully placing diatoms in these intricate patterns. Diatoms are tougher than dinosaurs! Diatoms are indisputably amazing creatures- maybe because they have had so long to evolve. The evolution of the estimated 20,000 to 2 million of species of diatoms is (obviously) complicated5. 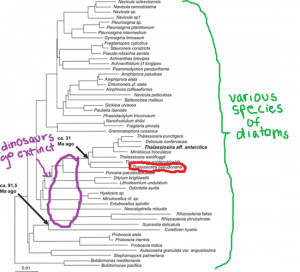 I have taken a phylogeny tree of diatoms from the Geology Society of America and highlighted only the information that makes sense to me or the lay person6. As you can see, there are lots of different types of diatoms. Thalassiosira pseudonana is circled because that is the type of diatom many scientists work with since its entire genome has been sequenced. Diatoms likely started out as a combination of yeast-like organisms and algae. Earlier fossil evidence suggests that the first diatoms were marine, but recent terrestrial fossil discoverers may challenge that. Scientists are confident that the first diatoms appeared in the Jurassic Age about 200 million years ago after finding physical remains,. And, diatoms are still omnipresent today. That means that 65 million years ago, diatoms survived a mass extinction when scientists hypothesize that an asteroid hit the Earth and sent the planet into a cold-spell, or volcanic eruptions released mass amounts of CO₂ into the atmosphere. This wiped out the dinosaurs and an estimated sixty percent of terrestrial plant life and 96% of marine life! But not the diatoms. Diatoms are strong! They adapted to Polar Regions where they still proliferate, and later, they found ecological niches where new species evolved and now thrive. Now, an estimated fifty percent of the world’s primary productivity is attributable to diatoms. Like the climate changes millions of years ago, current climate shifts connected to biogeochemical cycles are also altering marine environments for diatoms. Scientists are spending more and more time studying these biogeochemical cycles, especially the carbon cycle, because we are beginning to see shi fts in them that affect humans. 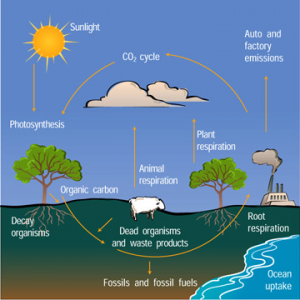 As part of the natural carbon cycle, carbon dioxide is released from a variety of factors, such as animals exhaling, organisms decomposing as fossils, and ocean exchange. Then, other processes, such as photosynthesis and ocean gas exchange, take in the CO2. This creates a carefully balanced, well-preserved system. But currently, anthropogenic (human-generated) activities are overloading the amount of CO2 released into the environment, and these changes are predicted to have catastrophic effects to the climate and thus ecosystems in the coming years. This shift is commonly known as climate change or global warming. Many of us our aware of this current buildup of greenhouse gases in the atmosphere, and most do our part to reduce our “carbon footprint.” However, for many, it stops there. What many people don’t know, and has been dubbed by The Seattle Times, “the lesser known twin of climate change,” is ocean acidification. As mentioned earlier, part of the natural carbon cycle involves the intake and output of carbon into and out of the ocean; this is how many organisms get the gases they need to survive. However, the more CO2 we put into the atmosphere, the more gets absorbed by the oceans. Initially, scientists thought this was a good thing; it was alleviating high amounts of CO2 in the atmosphere. However, upon further investigation, they discovered the ruinous effects of ocean acidification on the vast diversity of marine life. When CO2 from the atmosphere mixes with water, it creates carbonic acid and hydrogen ions. The excess of hydrogen ions not only decreases the pH of the ocean (makes it more acidic), they also bind with carbonate ions to create bicarbonate. This is harmful because carbonate usually binds with calcium to makes calcium carbonate that shellfish use to make their shells. So, when the H⁺ ion sequesters a key component to shells, shellfish either do not develop or have deformed shells and can easily die. We are seeing the effects of this highly in the Pacific Northwest with the many oyster farms that are currently failing, projecting future economic concerns. Oysters are not the only marine life affected by ocean acidification. A study published by the Nature Climate Change shows that fish placed in waters with a high concentration of CO2 can become hyperactive and confused, causing them to become unable to recognize predators. The drastic changes in marine life pose a serious threat to the structure of the whole ecosystem- a structure that we depend on for food. Diatoms are a model organism that play a key role in studying and reducing climate change. Unlike other marine animals, diatoms actually thrive in waters with a high concentration of CO2. This is because a higher concentration of CO2 prevents them from working hard to grab and fix it all during photosynthesis. Thus, they can be used to predict the effects of future, high CO2 oceanic conditions on the entire ecosystem. When diatoms sequester CO2 from the atmosphere, it helps reduce high atmospheric CO2 concentrations. So, not only does photosynthesis allow them to produce around one fourth of the world’s oxygen, it also requires an input of CO2– exactly what we have too much of! It’s a win-win! It might surprise you to learn that diatoms are used for industrial purposes, too. When diatoms die, the silica in their cell walls causes them to fall to the bottom of the ocean. When enough gathers, it creates deposits of diatomaceous earth. This earth can then be harvested and used for various industrial purposes. Technically speaking, this is fossil fuel because it is composed of millions of tiny, preserved diatom skeletons. But among other purposes, diatomaceous earth can be used as a filter in syrups and drinks, nail polish, car paint, cat litter, or as insulation to sound proof walls or keep in heat.Who knew that single-celled photosynthesizing algae could keep a house warm and decorate it too?! The possibility of using diatoms for engineering and biomedical purposes is also currently in development. For example, in a study published by the National Center for Biotechnology Information, researchers examine the potential to “embed diatom frustules in a metal-film membrane… magnetize frustules for pinpoint drug delivery… and produce silica nanopowders from frustules.” These products could potentially be used to make bone graft treatments! The oceans cover roughly 71% of the Earth’s surface, yet many overlook the complex systems and organisms inside them; among those are diatoms. Not only can their silica walls be used for industrial purposes, the are also crucial to scientific research. As global warming and ocean acidification becomes an increasingly larger problem, their role as a model organism becomes even larger. Diatoms are fascinating creatures that provide the basis of many systems we rely on.